The Scanter 6000 is an operating in X-Band 2D fully coherent solid state naval surveillance radar with software-defined functionality, developed by Terma to address market requirements for improved surface and low airspace situational awareness. Advanced techniques such as frequency diversity and time diversity provide superior performance. 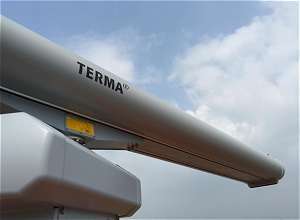 It is capable of providing simultaneous small target detection, helicopter guidance, and large and small target detection at close and maximum range. Scanter 6000 has been specifically designed as an affordable all-weather sensor solution to plug the gap between standard marine navigation radars and more expensive military surveillance radar systems. It may serve as a multi-role sensor system to meet requirements for tactical surface surveillance, search and rescue, and helicopter control. The Royal Malaysian Navy has selected the Scanter 6000 as combined navigation and helicopter control radar for their two Lekiu-class frigates mid-life modernisation and service life extension.